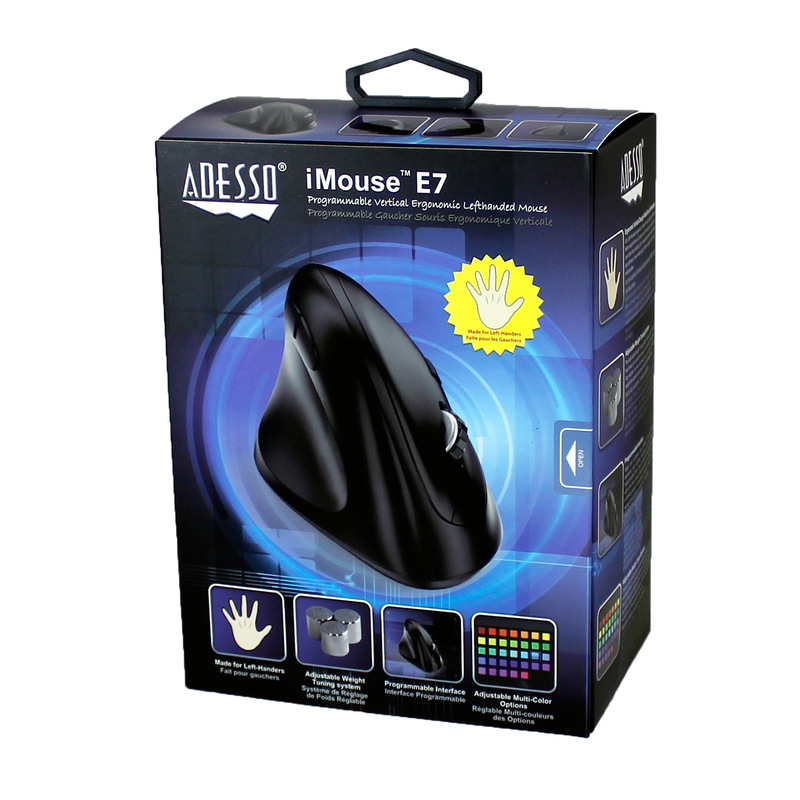 Adesso introduces relief and comfort for left handed users & gamers with the iMouse E7 USB Vertical Lefthanded Mouse! If your wrist pain just won’t seem to go away, try a specially designed vertical mouse that completely changes your stance and keeps your hand in its natural “handshaking” position. 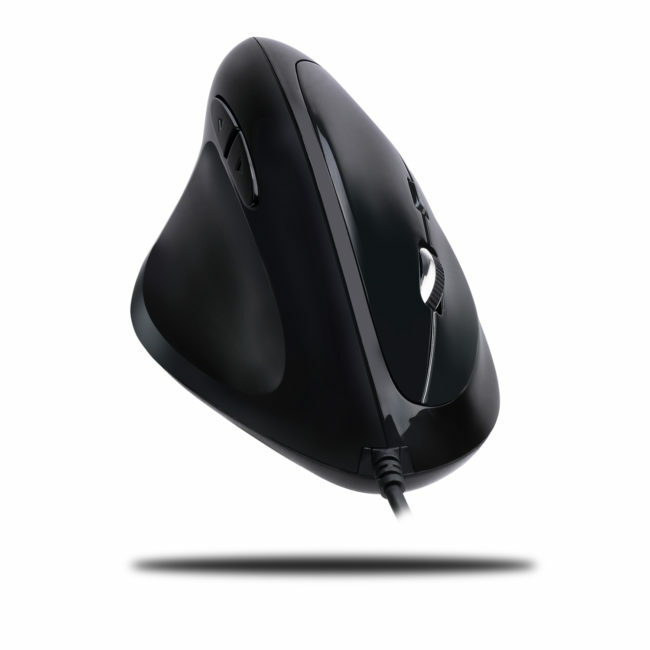 The shape is thoroughly designed for natural comfort and easy-to-reach mouse buttons. No finger stretching or reaching is needed to press or operate the buttons. 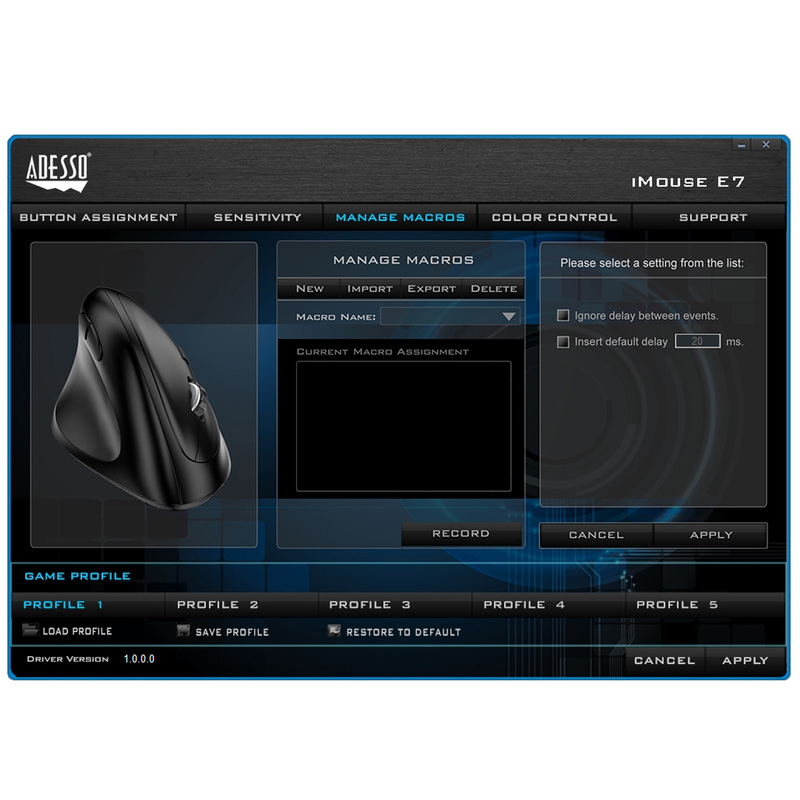 For gaming, the built in DPI switch on the top allows for convenient adjustment of your browsing precision without even letting go of the Adesso iMouse E7. 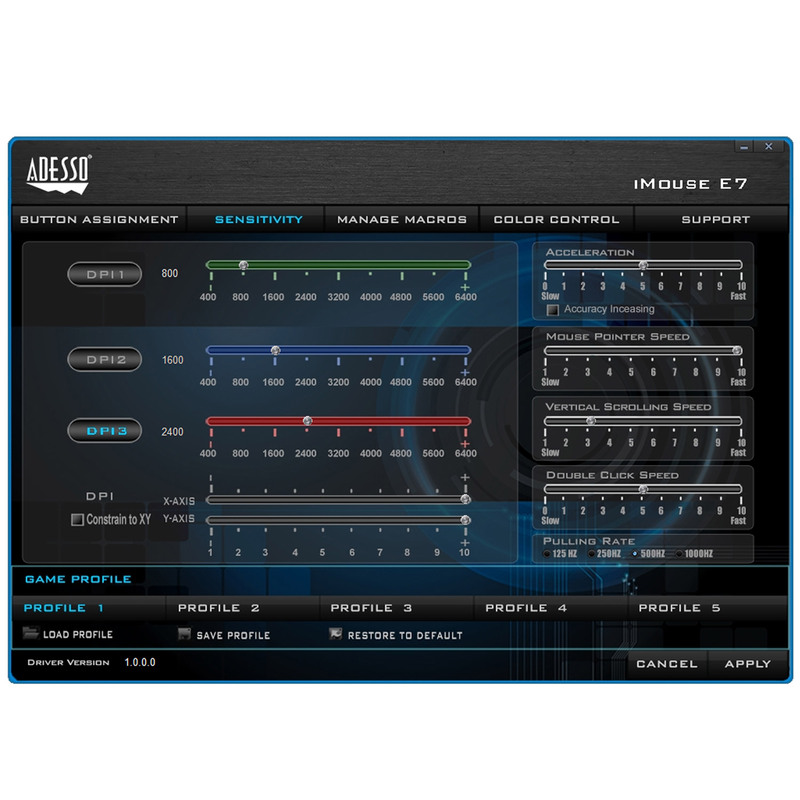 Optional advanced programming software will allow you to control and customize all 6 buttons , LED colors, and assign macro keys. 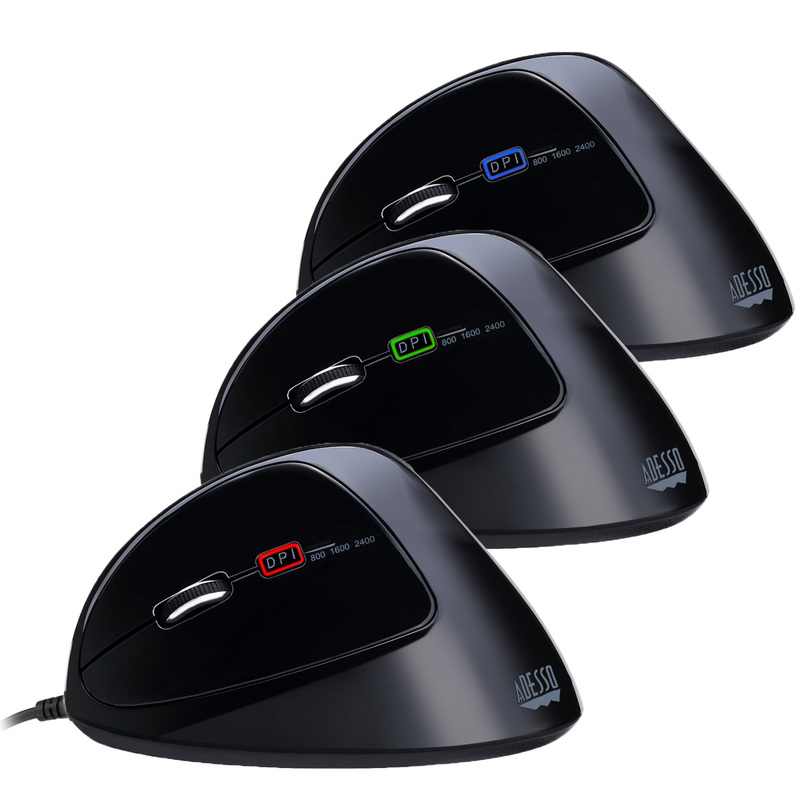 The iMouse E7 also comes with 3 additional weights inside that you can remove or adjust for a sturdier or lighter feel depending on your preference. 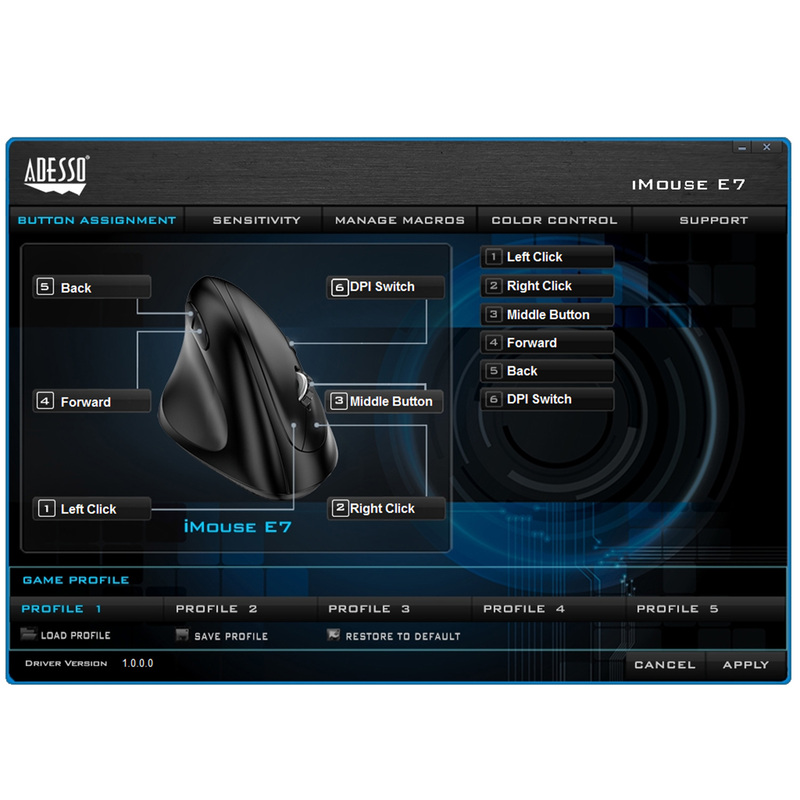 Start browsing the internet, your email, and achieve victory with various online games with the new Adesso iMouse E7 USB Vertical Lefthanded Mouse. The wrist-friendly contour of the Adesso vertical mice allows you to hold your hand in a neutral “handshake position”, minimizing your forearm muscles from twisting and the possible development of Carpal Tunnel Syndrome. 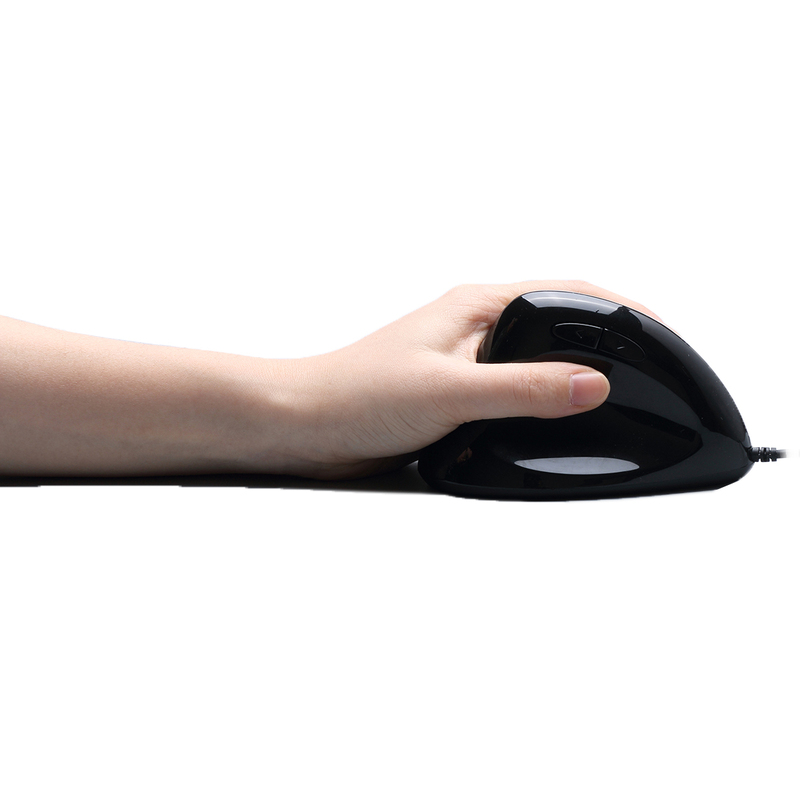 Normally, your forearm muscles are twisted from sitting flat on the supporting surface when using a regular mouse. This “flat position” causes strains on your muscles and leads to wrist pains. This is where the Adesso Vertical Mice become helpful and provide alleviation. Our Left-Handed vertical ergonomic design helps you achieve a more natural grip, better support, and natural wrist position. 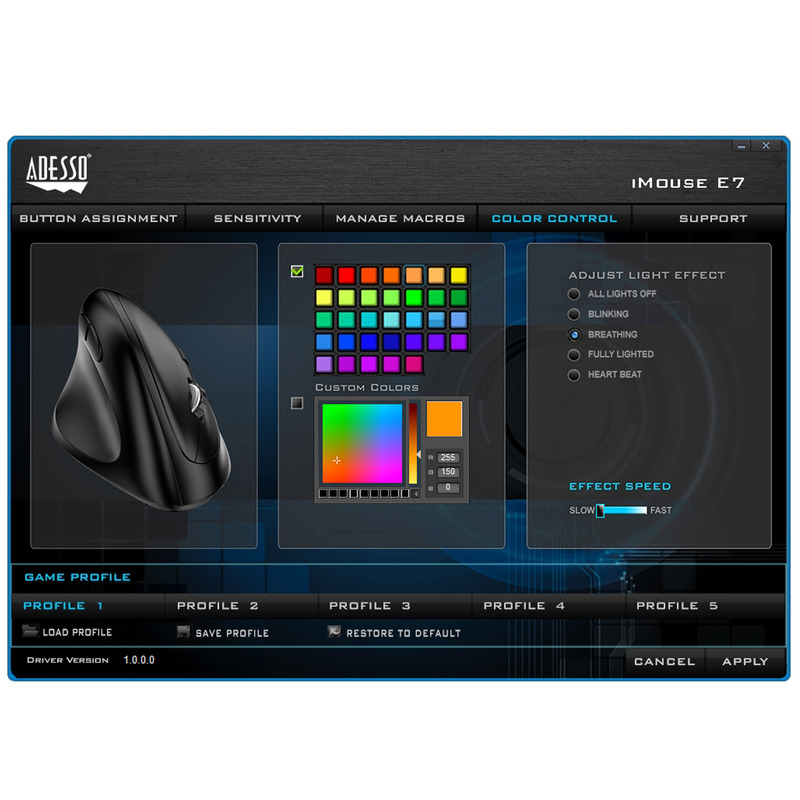 With our sleek design and added support, the Adesso Vertical Ergonomic iMouse E7 is perfect for long hours of use. 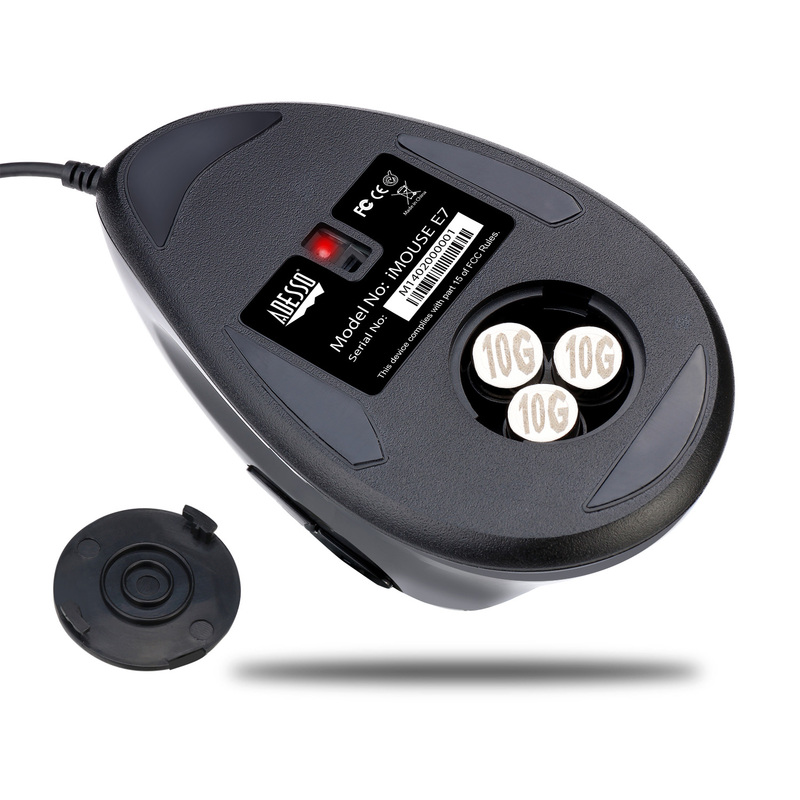 Adjust and customize your iMouse E7 to your liking to enhance your gaming experience with the included Programmable Driver. Easy to install, and navigate through, within the driver menu, adjust anything from mouse colors, to blinking speed, to assigning commands (macros) , and reprogramming buttons with a few simple steps. 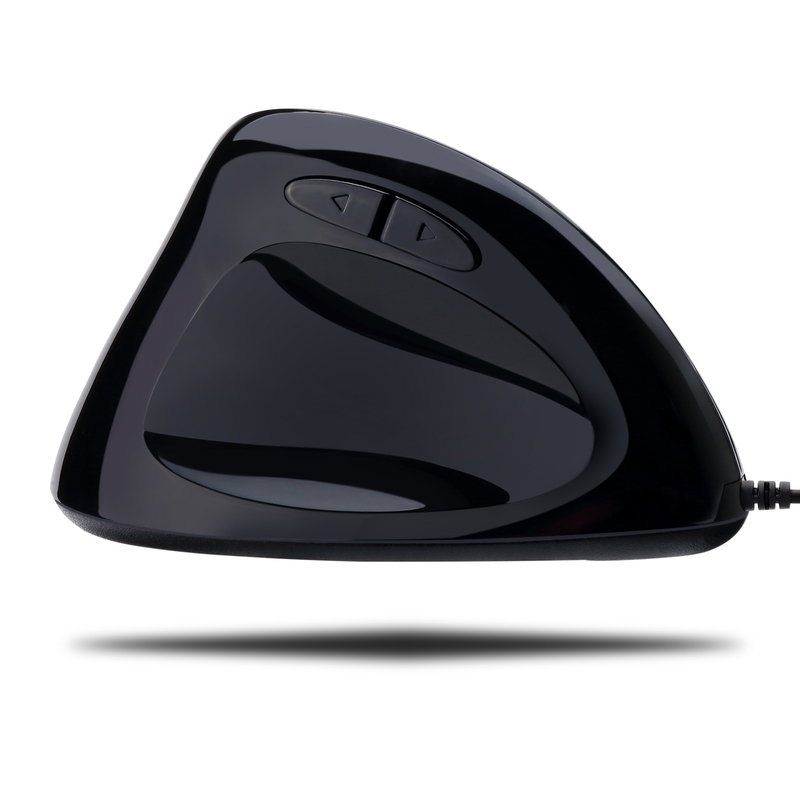 The Adjustable Weight Tuning System allows you to control how heavy you want the mouse. It comes with 3 removable 10g weights, to mix and match up to 30 grams of extra weight for a personalized feel and comfortable control. Attain higher precision and better accuracy with your choice of 3 DPI levels from an individual range of 400-6400 . Easily switch from three different DPI settings which change color depending on the level chosen. From the default settings of 400 (green), 800 (blue) and 1600 (red) the easily-accessible DPI button lets you quickly switch between the various computer tasks you partake throughout the day. Choose your backlit color and breathing intervals with the included driver to suit your personal preference and mood. Once set to your preference, the multi-colored LED lights let you work or play from dusk till dawn at your desk, study, or in the bedroom without disturbing others!